It’s the Tone of Choice. Have you ever said something in a tone that you really didn’t mean? Perhaps it was an aggressive or harsh tone but it was really meant to show your passion for something and not anger. Sometimes people take the tone the wrong way and feelings are hurt or anger is returned. Now add the element of social media – capital letters, exclamation marks, emojis and hashtags. Another layer of a “tone”. A form of unspoken communication. I love the soft tone of a grandmother. I love the gentle tone of a patient answer. I love the soothing tone of a mother’s prayer. The words can be the same, but it’s the tone that can set the stage for the delivery which in turn creates the environment for the acceptance. Tone. It’s a very important element of communication. In the New Testament, we read a lot about the Holy Spirit. To me the Holy Spirit has a beautiful, soft tone. The Holy Spirit leads with a tone which seems to always be steady and calm. I don’t know if that is the exact words as the scriptures describe but I know that it is the tone in which the Holy Spirit communicates to me. A soft, quiet, understanding, leading-the-way tone. A sweet sweet Spirit in my soul. What’s your tone? Harsh and hateful or gentle and joyful? We are representatives of Christ. Let’s choose our tone wisely. 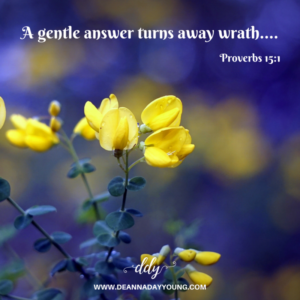 Proverbs 15:1 – A gentle answer turns away wrath, but a harsh word stirs up anger. This entry was posted in devotional, inspirational, motivational, spiritual on May 8, 2018 by Deanna Young.